Pedestrians gather on Temple Street which was the scene of an acid attack. Hong Kong, China (CNN) -- Another mysterious acid attack took place during the weekend in Hong Kong. It was the sixth such incident in the past year. The target is always a crowded street full of shoppers and the weapon of choice: plastic bottles filled with acid. The attacker (or attackers) throw the bottles from an upper floor or roof of a building overlooking the crowded street. Police have no suspects and no motive for the attacks. I went to the scene of the latest attack at the famous Temple Street Night Market -- an area that is usually busy with local families and tourists. Shopkeeper Khan Mohammed Bilal runs an electronics store, and he was working Saturday night when he heard the commotion. He stepped out into the intersection of Temple Street and Nanking Street and saw chaos. We do get nervous -- we do feel scared. Someone had just thrown two plastic bottles of acid into the intersection. He saw one person's red bag soaked with acid. He said he couldn't imagine what would've happened if the acid had splashed onto the person's head. He saw injured people crying. "We do get nervous. We do feel scared. When this happens, it affects our business... I don't know the purpose of this, why this person is throwing this liquid." Most witnesses believe the attacker was inside one of the old apartment buildings lining Temple Street. My photographer, producer and I decided to see just how easy it is to get to the top of one of these buildings. Most of the old apartment buildings have no front door to the entryway that leads into a stairwell. We walked up 10 flights past individual apartments until we reached the roof. Again, the roof entryway had no door. There was only a line of laundry hanging across the doorway. It was clear just how easy it is for anyone to walk off the street, get to the roof and throw objects off the top of the building. And the getaway? Easy. In fact, there are many options: the stairwell we walked up, another stairwell that exits the other side of the building... or the roof of the next building. The buildings are so close together a daring person can jump from roof to roof and descend another building's stairwell. Of course, we don't know for sure if the attacker(s) used the roof, but it is a realistic possibility. Tourists who were strolling through the area seemed either unaware or unconcerned. Ghadjar Siavoche of Geneva, Switzerland, comes to Hong Kong often for business. He already knew about the attack. "It doesn't disturb me because it's a very isolated incident. It's a pity for Hong Kong because it's a very nice city. People here are so charming and so nice." 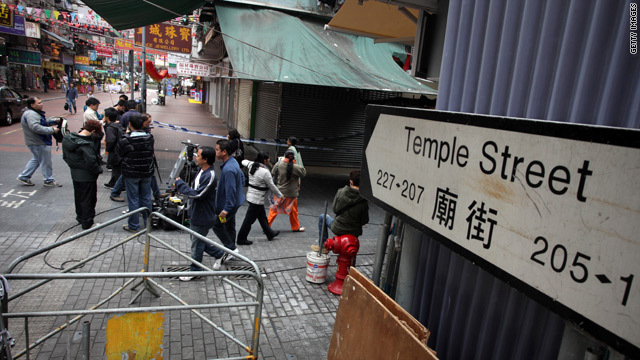 The city of Hong Kong is hoping to maintain that image despite the acid attacks. The police have no solid leads at the moment. They're hoping a $40,000 reward will motivate someone to hand over some information that can help them make an arrest.